We have a shot at this! Jennifer Roach has embraced the beauty and sprit of Colorado’s mountains since she moved to Colorado from Illinois in 1980. Since then she has summited over 1,000 Colorado peaks. 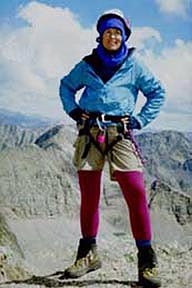 She finished climbing Colorado’s 55 Fourteeners in 1986, and in September 2001, she completed all 637 of Colorado’s ranked summits above 13,000 feet. This achievement culminated a 20-year labor of mountain climbing love. She became the 8th person to secure this goal, and only the 4th woman. In October 2002, Jennifer became the 3rd woman to complete a visit to Colorado’s 64 county highpoints, giving her a real understanding of the entire spread of Colorado from prairie to highcountry. Jennifer has hiked and climbed in many areas of Colorado, and has great knowledge of the State’s vast wilderness resources. In addition, Jennifer is a member of the coveted Highpointers’ Century Club for visiting more than 195 county summits nationwide, and she has done about half of the US State Summits. Pursuing a new venue, Jennifer has visited the highpoints of 25 of the 58 US National Parks. 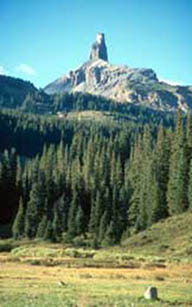 Jennifer is a member of the Colorado Mountain Club, the Sierra Club and the American Alpine Club. 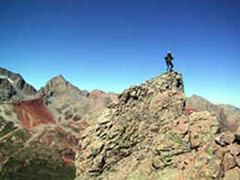 In other western states, Jennifer has climbed many peaks in Arizona, California, Nevada, Utah, New Mexico, Wyoming, Idaho, and Montana. Desert peak hiking has become a real penchant for she and her husband Gerry, and they are avid members of the Sierra Club’s Desert Peaks Section. 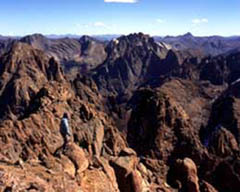 In 2004, Jennifer completed the 99 classic desert peaks on the Sierra Club’s fabled Desert Peaks List. 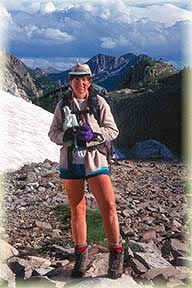 Jennifer also summited Mt Sanford in Alaska in 1995. Internationally, Jennifer has climbed many high summits in South America including Aconcagua, Ojos del Salado, Cotopaxi, Chimborazo, Sajama, Illamani, Huayna Potosi, Pico Bolivar, and Tungurahua. She has also summited most of Mexico’s high mountains with climbs of Orizaba, Izta, Popo, Toluca, Malinche, Teyotl, Sierra Negra, Cofre, Telapon, Tlaloc, Ajusco, Picacho del Diablo, Pescadores, Pinacante and Risco. Jennifer has climbed 49 of Scotland’s fabled Munros, Mount Ararat, Cerro Chirripo and Pico Tiede. 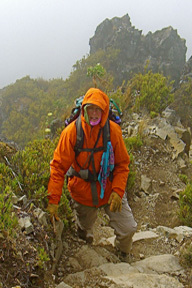 in Africa, Jennifer has climbed Mount Kilimanjaro, Mount Meru, Jebel Toubkal, Mount Cameroon and Ras Dashen. Aside from climbing, Jennifer enjoys running to stay in shape. With world-class trail running just outside the doorstep of her home in Boulder, Colorado, Jennifer has trained for several ultra marathons, including Squaw Peak 50, Collegiate Peaks 25 and other 50 milers, as well as other running activities. In 2000, 2001, and 2003 she participated in the Hardrock 100, touted as one of the toughest ultra runs in the United States. She finished the race in 2003. With her husband Gerry, she has co-authored two Colorado guide books, Colorado’s Thirteeners - From Hikes To Climbs and Colorado’s Lost Creek Wilderness - Classic Summit Hikes. Jennifer finds her activities in Colorado’s mountains to be a year-round pleasure, and continues to find her heart and soul deeply impassioned by the beauty and adventures of all peaks, both large and small. Jennifer lives with her husband Gerry in Boulder, Colorado USA.